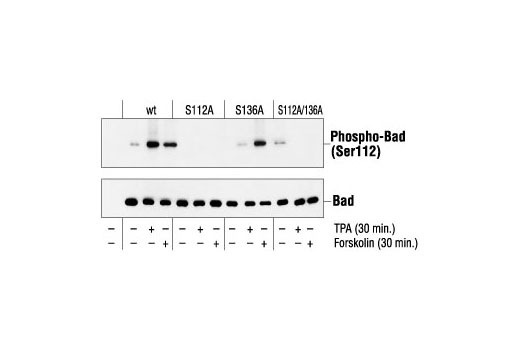 Western blot analysis of extracts from 293 cells transfected with Wild-type Bad, Bad (Ser112A), Bad (S136A), Bad (S112A/S136A) and treated with TPA or forskolin, using Phospho-Bad (Ser112) Antibody (upper) or Bad Antibody #9292 (lower). 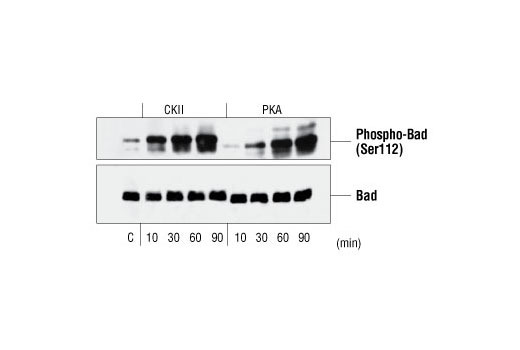 ﻿Western blot analysis of Bad fusion protein phosphorylated by CKII or PKA in vitro, using Phospho-Bad (Ser112) Antibody (upper) or Bad Antibody #9292 (lower). Flow cytometric analysis of COS cells, untreated (blue) or Calyculin A/TPA-treated (green), usingPhospho-Bad (Ser112) Antibody compared to Rabbit (DA1E) mAb IgG Isotype Control #3900 (red). 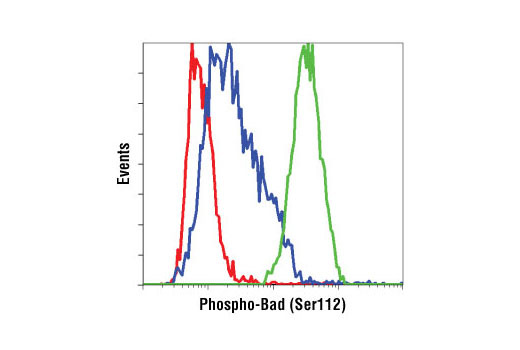 Phospho-Bad (Ser112) Antibody detects endogenous levels of Bad only when phosphorylated at Ser112. The Ser112 nomenclature is based upon the mouse sequence. The analogous phosphorylation site is Ser75 in human and Ser113 in rat. This antibody does not detect Bad phosphorylated at other sites, nor does it detect related family members. Polyclonal antibodies are produced by immunizing animals with a synthetic phosphopeptide corresponding to residues surrounding Ser112 of mouse Bad. Antibodies are purified by protein A and peptide affinity chromatography.